A rollicking adventure with an endearing cast and enough substance for all ages. ...Porco Rosso meets Last Exile, with WWI technology. The empires of Soux Bei Il and Roxche, though separated only by a river, have long been at war, with each insisting that their land was the cradle of humanity. The war is currently at an ebb, though, leaving Allison and Wil, two orphans who grew up together, to live their lives in relative peace; Allison as a military pilot and Wil as a student. They remain friends, exchanging letters and meeting during their vacations, but Allison has a knack for stumbling into adventure. When an old man with wild tales of a great treasure--treasure located in enemy territory--runs afoul of mysterious men, they find themselves caught up in an adventure that may change the fate of nations. It may be superficially a kids' series, but once Allison and Lillia gets underway the stiff dose of international relations and more mature supporting cast make this lively adventure series substantial and intelligent enough to interest viewers of any age willing to get caught up in the fun. The stories feature a solid balance of mystery as the characters struggle to figure out who's good, who's bad, and what's going on, action as they try to sneak, fly, bluff, and flee their way out of all manner of predicaments, and a touch of character development for good measure. All this is anchored by Allison--an endearing heroine with a mix of energy and insanity who runs the show and drags her loyal companion Wil along for the ride. Season one of Allison and Lillia is a marvelous little adventure series targeted at younger audiences that also has enough substance and fun for any age, so long as you have a love of adventure--highly recommended. Allison and Lillia is technically two seasons of one series, but for all practical purposes it's more like "Allison and Wil" followed by the sequel "Lillia and Treze." So, for the sake of not blowing too much of the plot, I'm going to review them separately. 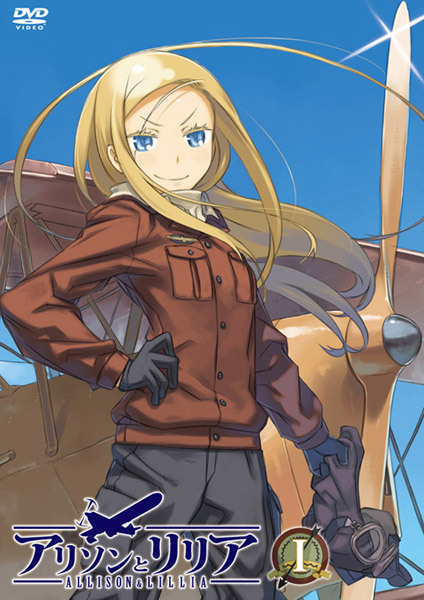 Season 1 of Allison and Lillia--which is really just "Allison," as Lillia isn't even born yet--consists of three four-episode story arcs based on a series of light novels. A roundly entertaining series, it follows the adventures that befall the headstrong military pilot Allison and her bookish companion Wilhelm during their seasonal meetings. The youthful character designs, teenaged protagonists (16-18, despite appearances), and initially simple plot point to a series aimed at a relatively young demographic, but don't write it off as kids' fare. The high adventure with a stiff dose of international relations in the background is substantial and intelligent enough to interest viewers of any age willing to get caught up in the fun. The only time the age target shows is the series' strong tendency to avoid killing anyone unless absolutely necessary. This isn't inherently a problem, but it works so hard in a couple of the big denouement scenes that it borders on silly. The international politics initially appear simplistic, but later arcs bring up plenty of murky middle ground and there are so many political triple-crosses that if anything it's a little hard to keep up with. The plots also have a mystery component, which is less whodunnit and more a game of figuring out who to trust and what's really going on. The exceptionally intelligent Wil eventually provides the Sherlock-style explanation from the pieces gathered along the way. All that is balanced nicely with plenty of action and adventure as the characters try to sneak, fly, bluff, shoot, and flee their way out of all manner of predicaments. 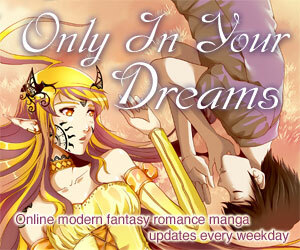 Everything is capped off with a touch of human drama and romance. The dynamic between Allison and Wil is what makes the series so much fun. They're very much a duo as far as their adventures are concerned, but the series is named after her because she's the one in charge. Not necessarily in control--quite the contrary, she's not all that sharp and it's Wil's job to figure out what's actually going on--but she's the one giving the orders and dragging him into the chaos. An act first and think later kind of girl, Allison is an absolutely marvelous heroine. She's cheerful and energetic, of course, but she's also competent, confident, and just crazy enough to leap off a cliff and order Wil to follow her. She's also human--she isn't afraid to freak out when the situation calls for it. Toss in a mischievous tendency to abuse her military connections to get where she wants to be, and you've got a character as endearing as she is fun to watch. Wil, in contrast, is soft spoken, analytical, and not at all happy about charging headlong into dangerous situations. His reason and calm aren't nearly enough to hold Allison back, though, so he ends up alternately smiling sheepishly and screaming in panic as he follows after her. They are, however, still a team when it comes down to it, standing side by side when it counts. This leads into a cute romantic subtext that surfaces in the later episodes. Allison, of course, gets flustered when trying to express her feelings and Wil is too dense to pick up on her blatant hints, but I don't think I'm giving anything away by saying that her proposal-of-sorts toward the end of the season is one of the most violently wonderful I've ever seen. We do, however, get completely gypped out of an onscreen kiss for no reason I can discern. A variety of additional characters--all of them older--liven things up. Most are only around for a few episodes, but Carr Benedict and Fi have large enough parts to qualify as main characters. Benedict in particular provides a nice counterbalance to the two youthful protagonists: In his twenties and a smooth, confident ladies' man. Breaking with stereotype, he's also an all-around decent guy and has some adult romance of his own. The series is set in a WWI-era-ish fantasy world that feels functional and real without being so conspicuous it distracts from the characters. The continent of interest is broadly European and divided between two empires long at war, each of which is made up of smaller countries with their own bits of culture and flavor. The technology is remarkably realistic--there's no magic of any sort, no aerodynamically impossible aircraft, and really nothing but perfectly reasonable vehicles and machinery. My only significant complaint with the whole thing is the somewhat flubbed final episode. Set four years after the bulk of the adventures, it functions as a segue between the first and second season, and essentially explains what Allison and Wil decide to do with their lives. I'm dancing around a spoiler here, but the issue is Wil's big decision makes essentially no sense. It's not that it couldn't make sense. On the contrary, it's entirely possible that given the political climate and the things he's learned about international relations his decision is the only reasonable one. But we're not given any of the necessary supporting information. As a result, it seems arbitrarily dramatic and rather out of character. On the murky morality front (and this is definitely a spoiler, so skip the rest of this paragraph if you're at all sensitive), there's also the fact that the violence-averse main cast is awfully quick to forgive another character who was essentially planning to kill an entire trainful of innocent people largely for convenience' sake. This throws an unnecessarily dark shadow over the end of the series (particularly in contrast to its relative pacifism elsewhere) and further colors Wil's poorly-justified decision in the final episode. The visuals are inconsistently good. Good in that the character designs are appealing and distinctive (if a bit young-looking), the backgrounds pretty, and the mechanical design uniformly realistic. The sometimes-computer-animated aircraft also blend almost perfectly with the hand-drawn art. Inconsistent in that the budget is being noticeably stretched, some of the character animation is awkward, and the action is of uneven quality. Much of the air combat is punchy and exciting while other sequences are clumsy and choreographed badly enough to be distracting. On average it's good enough to get the job done, though it never quite wows. The music is better. There's a lovely, lilting opening theme sung by Shione Yukawa, and Shusei Murai supplies cheerful orchestral fare throughout as background music. The end theme is more generic, but not out of place. The Japanese acting is of uniformly high quality. The main cast is lead by a strong and lively Allison, voiced by Nana Mizuki. Consumate veteran Kouichi Yamadera as Benedict is also memorably amiable and likable. Wil and Fi (Motoko Kumai and Mamiko Noto) are somewhat lower-key characters, but both sound distinctive. My only complaint would be that Kumai's voice is a little too feminine on occasion, which becomes more noticeable when Wil is older. The minor characters range from interesting to a little on the broad side, but that's the series itself, not the acting. On the whole, season one of Allison and Lillia is a marvelous little series targeted at younger audiences that has enough substance and fun for adventure-loving viewers of any age--highly recommended. Topping the list of light adventure fare is the classic Nadia, which is quite similar if a little more fanciful. The same can be said of Miyazaki's Laputa: Castle in the Sky, while Porco Rosso has a similar fascination with aircraft and pre-WWII-era setting. Similarly alternate-world low-tech can be found in Last Exile, though that series is a bit heavier and more military in its theme. Though the mood and themes are drastically different, I'll also mention Dennou Coil as another of NHK's "kids'" series with much broader appeal than you'd think. 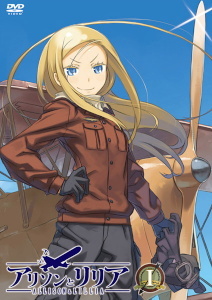 The story is based on the four books in the "Allison" series of light novels by Keiichi Shigusawa; these are followed by six books in the Lillia and Treze series, on which the second season is based. There is also a third set of three novels in the Meg and Seron series, following some of Lillia and Treze's friends. 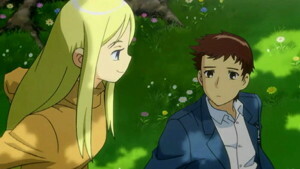 The character designs and visual style of the anime adaptation are taken directly from Kouhaku Kuroboshi's illustrations in the novels. There currently exists no manga adaptation; the story was adapted directly from the novels by NHK, Japan's public broadcasting equivalent of the BBC, airing on their high-def BS2 channel (it is, of course, in high-definition format as a result). There is, however, a piece of Nintendo DS visual novel software; the DS is held vertically like a book, with the text displayed on the screens overlaid on images from the story. Note that Wil's name is Wilhelm, not William, and in fact the cast is quite good about pronouncing it as the appropriately Germanic "Vil," a bit more impressive since there technically is no "V" in the Japanese language. Speaking of names, Soux Bei Il, unlike Roxche, puts names in the Japanese order. Thus, Carr Benedict's family name is Carr. The characters' ages are only mentioned in the last episode, but if you do the math backwards they're probably around 16 at the beginning of the series moving toward 18 in the final story arc. Sentai Filmworks' aptly-named "Generation 1" box set includes this entire first season in Japanese (only) with an English subtitle track; the only bonus features mentioned are clean opening and endings. Available in North America from Sentai Filmworks on a Generation 1 box set of the entire season. RightStuf has the set available for order. Allison and Lillia (Season 1) is Copyright © Keiichi Shigusawa / ASCII Media Works / Allison and Lilia Committee Any images are the property of their respective rightsholders, and included for review purposes only under the fair-use clause of US copyright law.